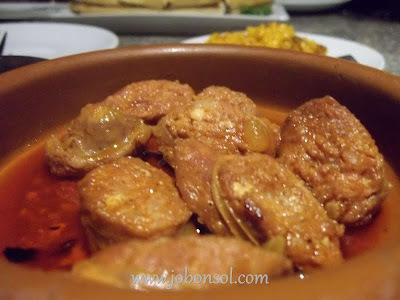 Tapas, Paellas and More...I really love paella and I've been wanting to learn the recipe since I kept buying the dish for noche buena every year at a Spanish restaurant far from home. 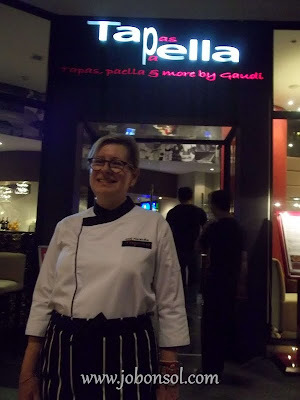 I've just attended the cooking-demo/food sampling event of Tapella by Gaudi at Greenbelt 5, Makati last Monday learning more than just paella and appreciating more of Spanish cuisine. We were first introduced to the executive chef of Tapella by Gaudi, Chef Alexandra Cacho who's not just fluent in English serving Spanish dishes for years in the Philippines. 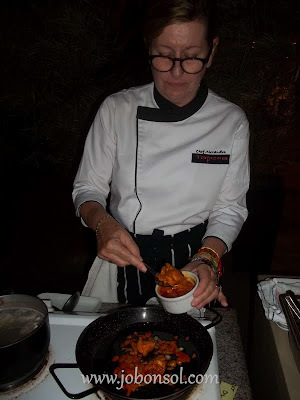 She started teaching us the first steps to making Manchego Paella, an original version of the famous Spanish rice dish with Manchego cheese, shrimps, chicken, asparagus and broccoli. Manchego, (officially Queso Manchego), a cheese made in the La Mancha region of Spain from the milk of sheep of the Manchega breed, aged for between 60 days and two years is actually available in most deli and grocery shops nationwide according to her. She introduced us to the basic broth that makes the flavor of paella really aromatic, a mixture of onions, garlic, any vegetable, chicken bones in boiling water and sauteed in olive oil the capsicum (red chili pepper). 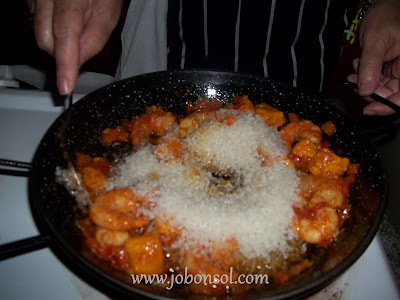 Then she added the pre-cooked chicken and shrimps to the mixture. 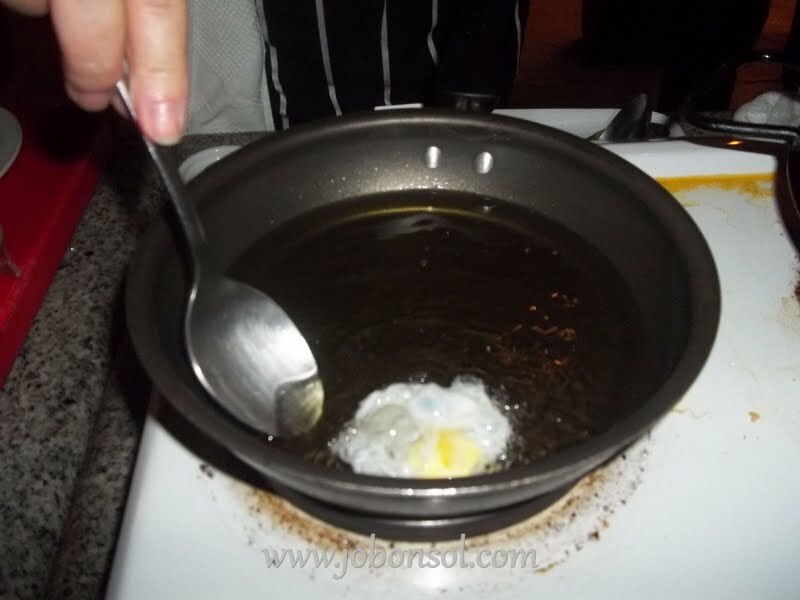 She stirred the ingredients to make sure that it won't burn and stick to the pan. 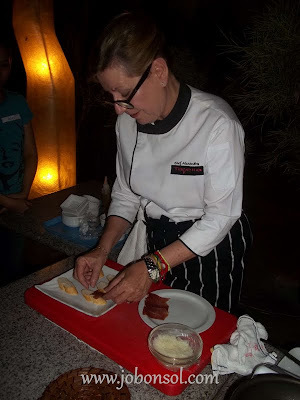 She introduced us of cooking raw rice to the paella with the sauteed ingredients and gave a trivia about how height actually affects the length of time cooking rice in different countries. 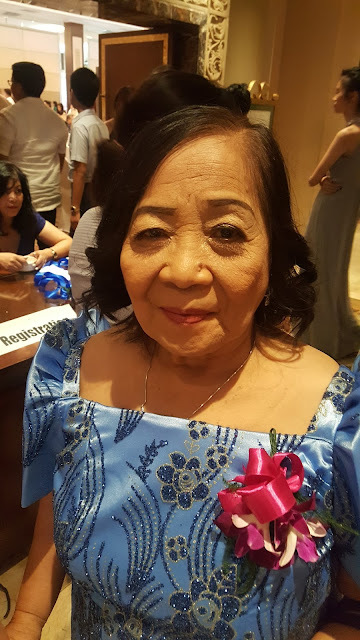 She said that if it takes only 15 minutes to cook rice in the Philippines, it takes about an hour to cook the same rice in Mexico and that's actually one fact I have never learned anywhere. Contrary to beliefs that cooked rice should be added to make paella, she stirred the raw rice with the sauteed mixture in olive oil saying the broth prepared before the sauteing should help cook it. After stirring the rice to the mixture, she added the broth slowly using a ladle. She covered it to simmer for a few minutes and added the ground saffron she actually regularly buys from Spain. 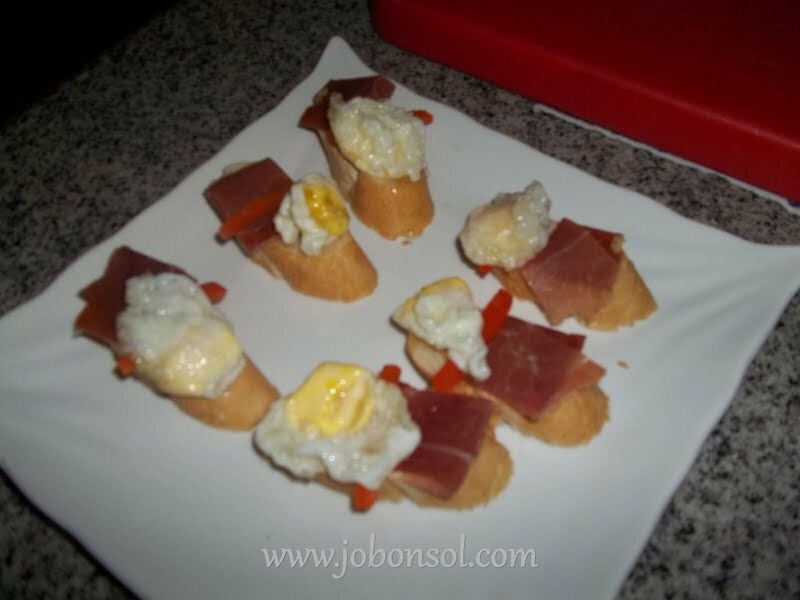 Meanwhile, she prepared the Cojonudos with Jamon Serrano and Pimiento Tapas. 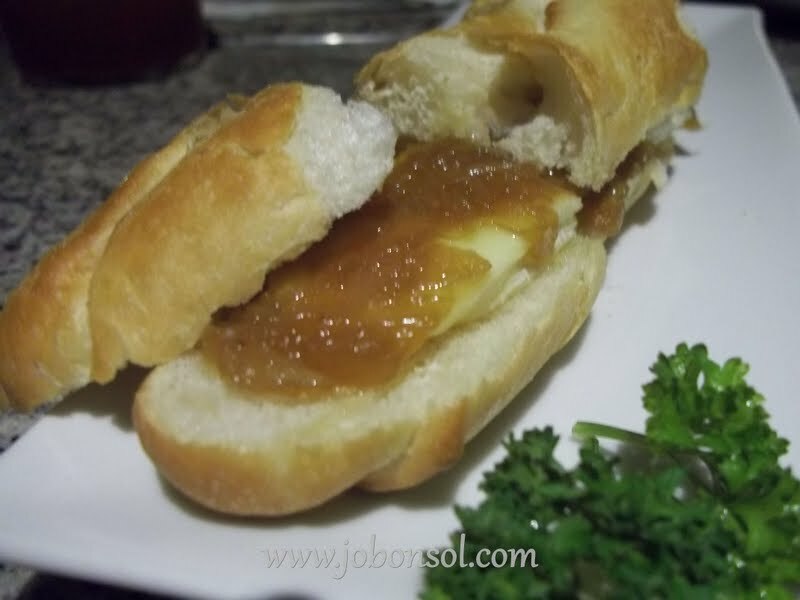 Using a slice of a French bread, she drizzled a little olive oil, topped it with fresh Jamon Serrano and a slice of red Pimiento. She fried raw fresh quail eggs and put them on top of each bread and voila, Cojonudos Tapas delight! 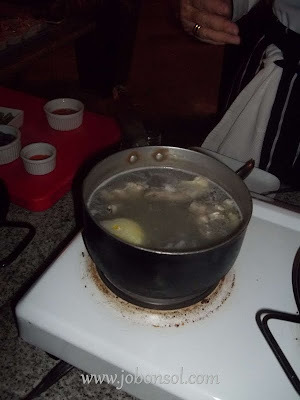 After making the Tapas, she checked on the paella and saw that the broth had reduced. She topped the mixture with Manchego cheese and covered to simmer for another minute or two. 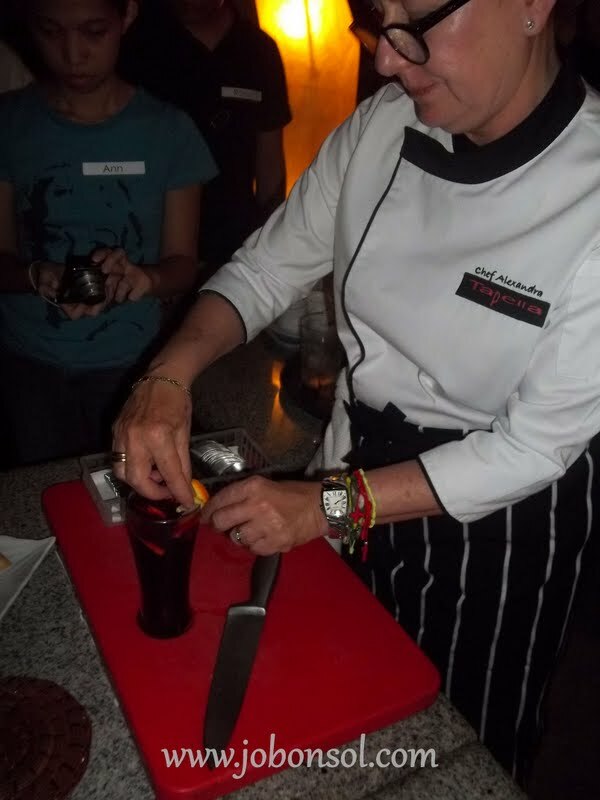 She then started showing how to make the Sangria; brandy, any kind of liquor, orange juice, soda and slices of fresh oranges in a glass. 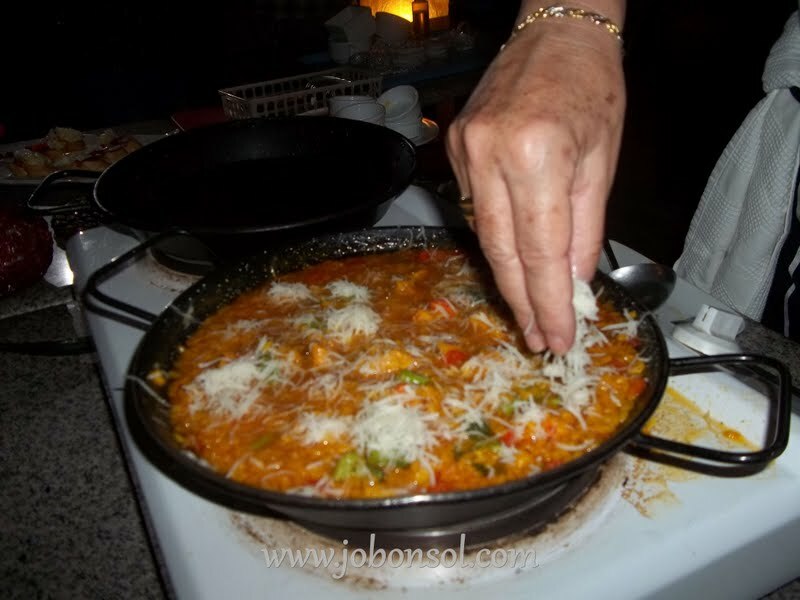 When the Sangria was ready to drink, she invited us all to get a spoonful of the Manchego Paella. 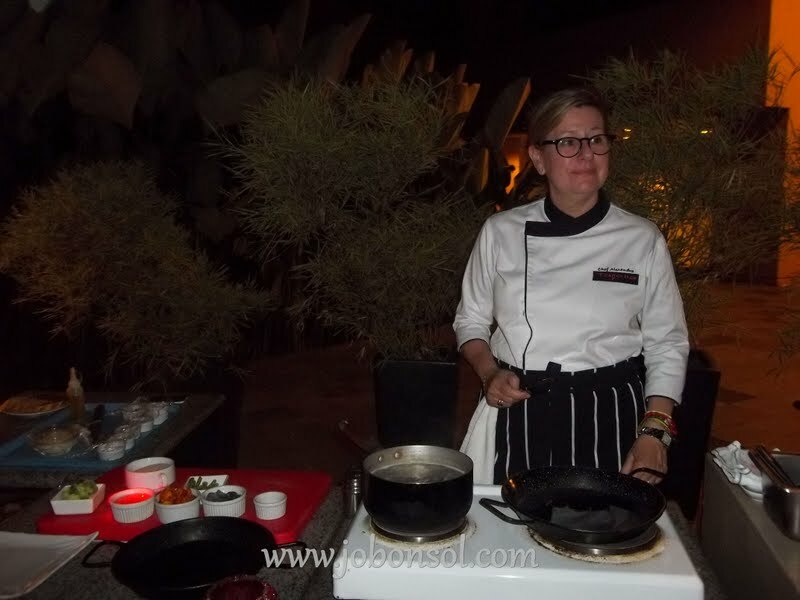 Everyone sat down when the waiters started to serve all the dishes cooked by Chef Alexandria Cacho. 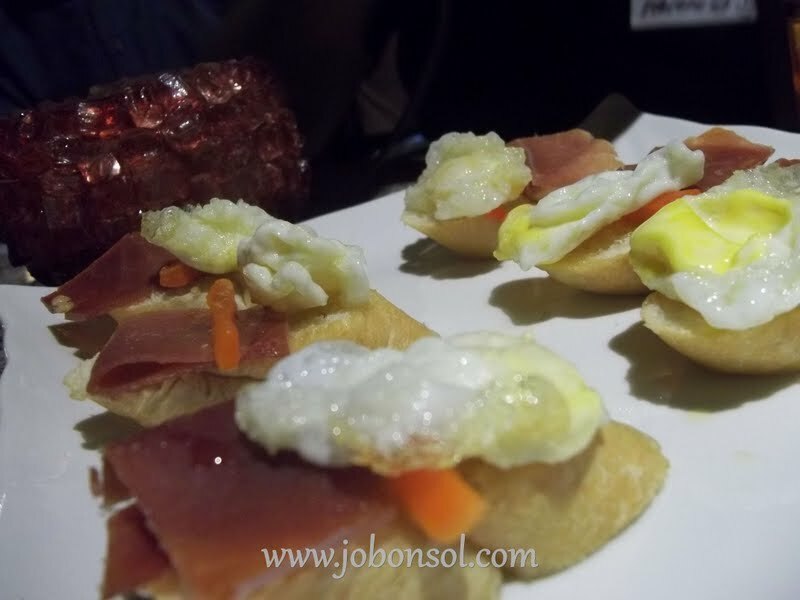 First, was this Cojonudos with Jamon Serrano and Pimiento Tapas which really made me want to love quail eggs in olive oil more. 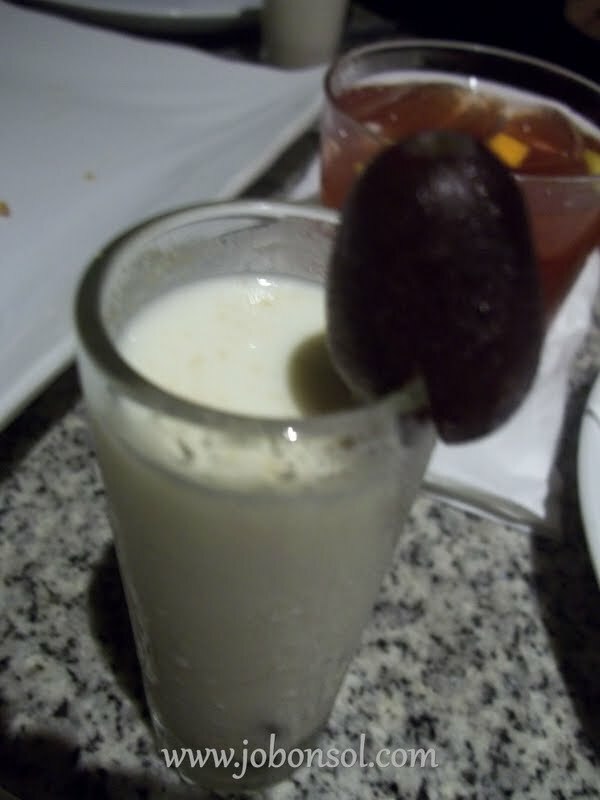 Then we all had a sample of Ajo Blanco on a shot glass (a traditional cold soup made of garlic and almonds) with fresh grapes and their Camembert with Caramelized Onions which really made me appreciate onions more. Then, we were served this very delicious Chorizo Stewed in Red Wine, the dish I won't ever forget from this restaurant - flavorful, exciting and really strong because of the spices from the chorizo. 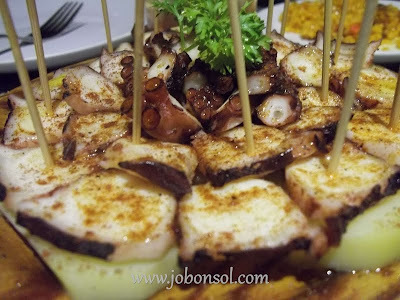 The Octopus with salt, paprika and virgin olive oil on a bed of steamed potatoes was also one of the most delicious appetizer I'd always remember of Tapella. 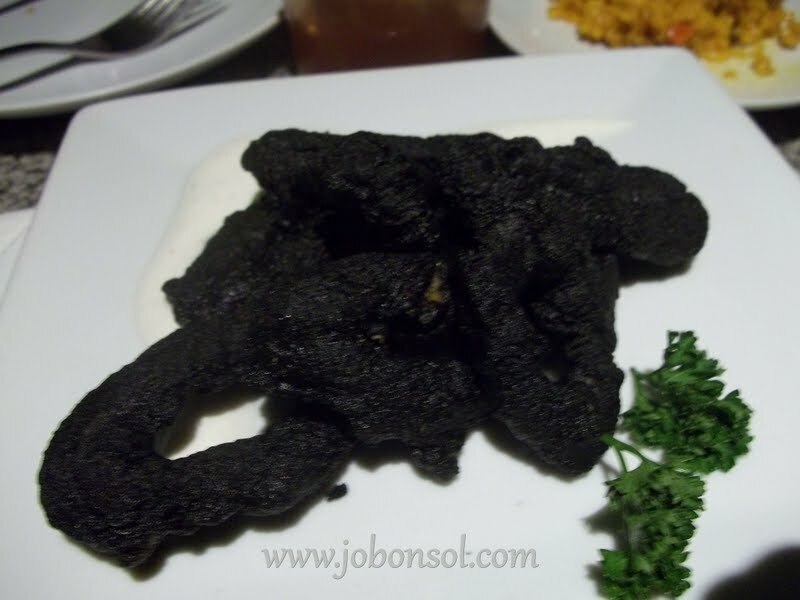 Distinct from this restaurant was also this Calamari with Black Ink Batter (Squid dipped in batter mixed with its own ink). 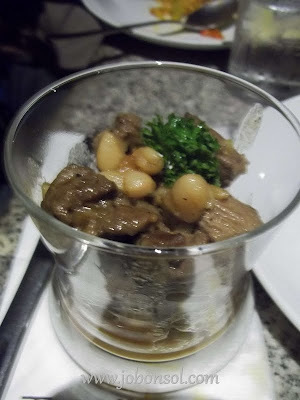 We also had a sample of their famous Beef Tenderloin Salpicado with White Beans. And finally, the Pièce de résistance, Manchego Paella that Chef Alexandria made. I never thought that cheese can actually make a paella dish more exciting. 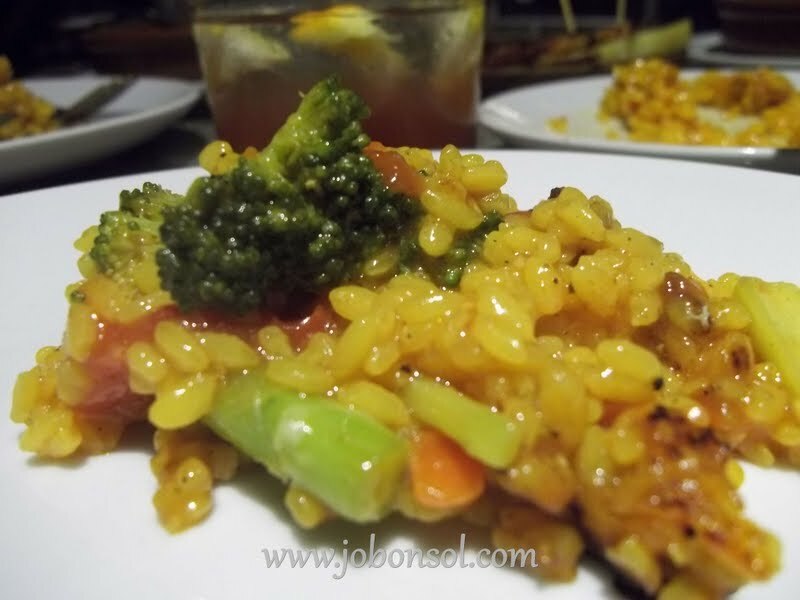 The sweetness of the asparagus with the broccoli complimented the tasty rice with saffron and the ingredients. I thought that anything can be added to a paella dish but I've just learned from Chef Alexandria Cacho that it was most important to savor the flavors from the rice and mixing so many ingredients like seafood with chicken and all types of meat will overwhelm the palate. After experiencing the delightful taste of Tapella by Gaudi's Manchego Paella, my preferences about the dish actually changed and I'm very grateful. 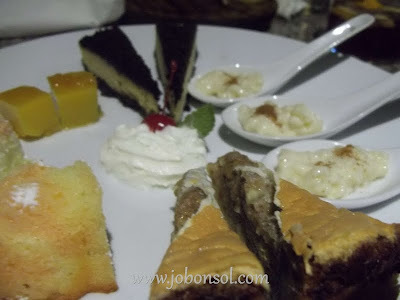 The sweet ending was the medley of their delectable desserts. 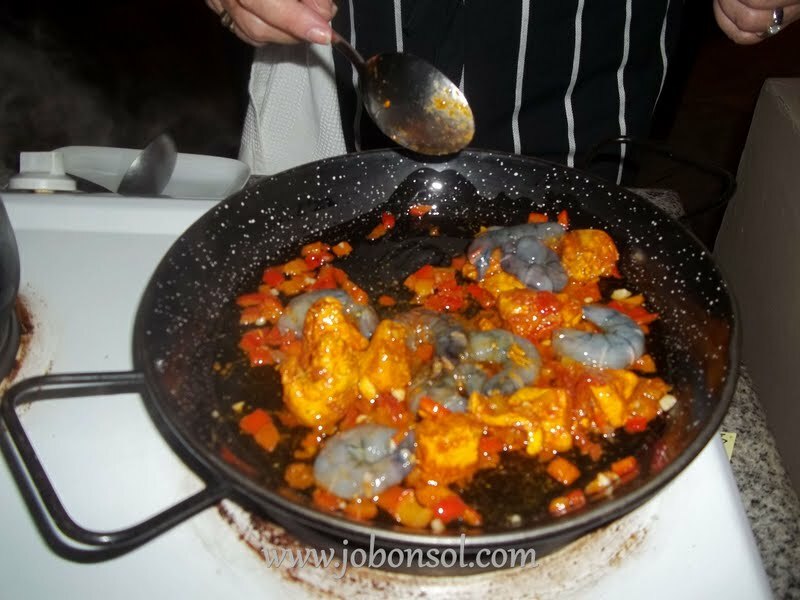 I really enjoyed every dish with gusto and learned more than just cooking paella. I'm really grateful for all the information and the memorable dining experience at Tapella by Gaudi Greenbelt 5. Tapella is open daily from 11am until 12mn with offers like Wine-All-You-Can paired with tapas and canapés served every Friday from 6 to 9pm. They also have a complimentary WIFI- a premium amenity among Gaudi Restaurants. 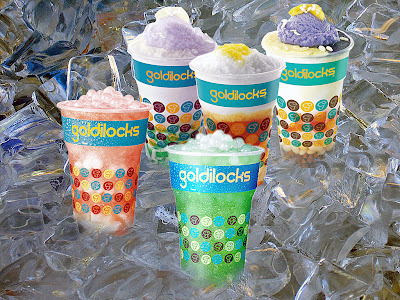 Tapela by Gaudi is located at the Ground Level of Greenbelt 5 surrounded by top business offices, eight theaters and high end shops in Makati, ideal for business lunch or romantic dinners. 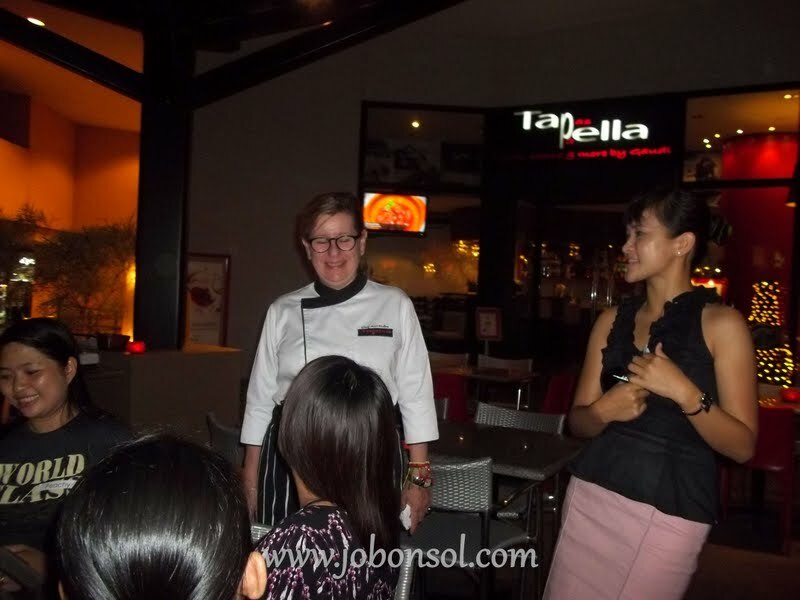 TAPELLA offers a wide variety of Spanish cuisine served in an informal and relaxed ambiance. They specialize in tapas and paellas plus salads, pastas and desserts served the Spanish way. For more information or reservations, please call 7572710 and 7572711.